You probably all know that John passed away on August 8th aged 81. 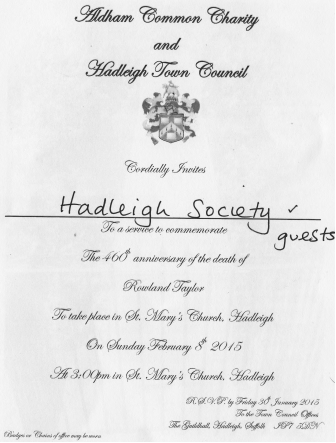 We will particularly miss him from the Hadleigh Society, as one of our founder members. All his life he was active and passionate across so many spheres with Hadleigh very central, but his enthusiasms covered a broad range. Fifteen years ago in this newsletter we published a brief biography, as follows. 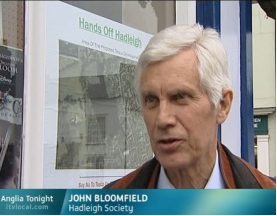 John grew up in Hadleigh between the Wars. His wartime interest in aircraft predestined that he joined the RAF as soon as he was old enough to fly. In a career as an air electronics officer spanning thirty-one years he specialised for a time, in underwater acoustics and Soviet submarines and eventually ‘landed’ in the Directorate of Training (Flying) in the MOD. Parallel with his service career he became interested in small historic buildings, giving courses for the Field Studies Council and the (then) University of Cambridge Board of Extra Mural Studies as well as running a consultancy on vernacular architecture that took him to many parts of the country. He helped found the Hadleigh Society in 1982, realising that Hadleigh was historically very significant but was under threat from insensitive treatment. He believes passionately that the character of Hadleigh, from its buildings to its educational and cultural life, is special and that we all have an obligation to future generations to help guide its evolution, using the highest possible standards. Over the years he and Tricia hosted several garden parties for the Society at the ‘Pink House’. When someone does work on Hadleigh in a few year’s time, I'm sure that the question will be asked 'how could they be so short sighted about matters of such significance?' Difficult to answer, in fact I fear that there is no answer, save to say that even with people of goodwill all doing their jobs properly, there should be some mechanism which says 'Hang on a minute. Is this really doing justice to our heritage? Is this really what we want to leave for future generations?' In this case is it one of old buildings versus old people? If we are concerned with the quality of life for our citizens who have contributed in their way, a lifetime to us all, then what does it matter if we take a little more in finance or time to get it right? More consultation at the preliminary stages of any project would draw people together more and a re-run of the latest incident might be avoided. Those who don't learn from their mistakes may be forced to let their children and their children's children judge them by those mistakes. History should judge John well. The Hadleigh Society has had an oak tree planted close to John’s grave in Hadleigh Cemetery. From an original presentation by the Hadleigh Society History group in November 1990. This article follows on from the article on the Hadleigh Local Board in the previous HSN; it is the second of four. N.B. Paragraphs in italics are direct quotes from the 1871 Board minutes or correspondence. ‘The surveyor having reported that Betts & Maskell had applied for an advance of 1 shilling per week on their wages in consequence of the advance in agricultural wages, he was directed to give the required increase’. ‘The question of Messrs Newman & Harper’s charge of 3 guineas for Advocacy was brought before the Board when a general feeling was being expressed that it was understood that the charge for recovering rates was included in the Clerk’s duties, and Mr Harper having withdrawn his charge of 1 guinea in this respect, the balance of 2 guineas was allowed and an order drawn accordingly’. The Board was responsible for the maintenance of roadways and footpaths in the town. Decisions made at the monthly meetings were carried out by the Surveyor, who was expected to attend all meetings of the Board when required and to ‘deliver to the Clerk on every Monday morning a statement in such form as the Board shall from time to time require of all moneys paid by and material supplied to him for the use of the Board during the then past week, and of all sales of sewage, manure or other matters effected by him during such week’. 2. That the carting should be paid for by the piece not by the day. The Surveyor being empowered in each case to make the best bargain for the Board that he can according to the circumstances of the case’. Local landowners must have found this a profitable source of income when there was a plentiful supply of female and child labour to pick stones from the fields. Those payments made to the Surveyor for manual labour, of sums between £6 and £10 and drawn at the monthly meeting would include the breaking up of the pit stone before it could be applied to the roadway. ‘We are instructed to inform you that your tender of £4 for the road scraping and sweepings for one year from the second inst. is accepted, subject to the same being removed within twelve hours after notice from the surveyor on pain of forfeiting the same to the Board and on terms of payment of the money in advance. We have to observe also that in your tender you add the words “and whatever may arise” which are not in the notices issued by us. Your contract must extend only to what is mentioned in the notices. A letter from you stating that you agree to the above terms will oblige’. But not all of the muck could be sold for roads of this construction; they absorbed decomposing matter and were smelly and muddy in winter and smelly and dusty in summer. Dust in the summer months caused the problems which were overcome by street watering, which you will remember was one of the causes of the higher rate paid in the town centre. This cost led to disagreement amongst the Board. In April the minutes record: ‘Proposed by Mr John Cook & seconded by Mr R H Cook: That the same streets be watered if and when necessary, during the ensuing month, as were watered last year. An amendment was proposed by Mr Wilson: that the question of watering the streets be postponed until a future day. This amendment not being seconded, the original proposition was declared and carried. The Surveyor was directed to get the watering done as inexpensively as he could and to that purpose to make all necessary arrangements’. ‘It was proposed by Mr Wilson, seconded by Mr Robinson that the present system of watering the streets be dropped. Amendment proposed by Mr John Cook seconded by Mr Powell that the present system of watering the streets be continued until the next monthly meeting. Mr Wilson therefore withdrew his motion and the amendment was therefore declared carried’. It seems strange that his supporters in calling the meeting were not prepared to support him. It was proposed by Mr John Cook and seconded by Mr RH Cook that the existing system of watering the streets be continued until the end of the present season. ‘Amendment proposed by Mr TW Wilson that the proposition not be carried’. The amendment was not seconded whereupon the original proposition made by Mr J Cook was declared carried. The Board then set the rate for 1872. The attention of this board having been called to the bad state of repair of the surface of the market place and its approaches, we are directed to communicate with you upon the subject and to request that you will cause the same to be put into a state of proper repair. ‘Whereupon Mr John Cook, one of the Feoffment Trustees, stated that they would put in repair as soon as the proper time arrives’. Attention having been called to the holes in the footpaths by the side of the High Street the surveyor was directed to complete the curb where necessary from Spooner’s shop to Laslett’s shop on the west side of the High Street by brick curbs and by levelling and filling up the pebbles, and that he gave notice to the owners of adjoining properties that on their supplying stone curbs the Board would fix the same at their own expense. The Surveyor wanted to experiment with a different method of repairing footpaths and in July applied for permission to lay down a portion of the footway by the side of the High Street with gas tar and road sand. The Board ordered him to lay down a piece in front of Mr Walter Kersey’s shop, the cost of which was not to exceed in all - £2. Unfortunately we do not know how successful this trial was or whether Edwin Downs was able to keep costs within budget. ‘the supplying of a new pump in the room of the existing one placed near Toppesfield Bridge which has burst & become useless & irreparable’. The lowest tender from Rope & Hanford for £4. 12s 6d was accepted. The Pound at Hadleigh Bridge needed repair in July & Mr J.A. Pettit got the job with his estimate of £1. 8s, undercutting J.B. Spooner by 1s 6d. On 1 May ‘the Surveyor having reported that one of the pulks near Mr Chisnall’s house in George Street was out of repair he was ordered to repair it & for that purpose to procure tenders & submit them to the next meeting’. (A pulk is an East Anglian word that appears to refer here to the shallow pools in the gutter made to give access with a bucket to natural spring water as it flowed through the town). By the June meeting the tenders were in. They read as follows: J.A. Pettit £1.12s.6d; Japhet Cook £2; J.B. Spooner £2.10s. Mr Pettit’s tender was accepted unanimously. ‘It was resolved that a committee consisting of Mr S.A. Kersey, Mr Wilson & Mr Chisnall be appointed to consider & report what course shall be taken with reference to a piece of land near Mr Henry Allan’s house in the Angel Street which the Surveyor had reported as being productive of nuisance’. ‘It was reported that the committee … had not met in consequence of Mr Chisnall’s illness’ – the matter was allowed to drop!! If you have attended one of our recent talks, you will have seen and heard our new public address system in use. Sue Angland applied for a grant from the Big Lottery Fund 'Awards For All' scheme, and we were pleased to receive a grant of £642 for the purchase of some new sound equipment. We bought two tie-clip radio microphones and one handheld microphone. They will be kept at the Guildhall Complex and may be used by other community groups as well. We are very grateful to the Big Lottery Fund for their generous grant and look forward to many years of being able to hear our speakers clearly! In 1544 Rowland Taylor became Rector of Hadleigh where the new Protestant reforms of Edward Vl's reign were adopted. However, in 1553, Mary Tudor became Queen and reinstated the Roman Catholic religion but Taylor, and others refused to give up the Protestant changes and beliefs. His arrest was ordered in March 1554 and in January 1555 he was excommunicated and sentenced to be burnt at the stake. He was returned to Hadleigh and on February 9th 1555 burnt at the stake on Aldham Common. Aldham Common was enclosed in 1729 with the income to be used for the 'poor of Hadleigh'. Today the Aldham Common Charity administers the land and the money raised is distributed in grants.